Minted to perfection in pure gold (.9999 fine), by the Royal Canadian Mint, this bar is encased in a tamper-proof plastic shell that protects its luster and serves as an added layer of security. The shell also includes an assay certificate with a unique serial number. Each bar bears a repetitive motif of the Mint’s stylized maple leaf logo on one side and inscriptions of its weight and purity on the other side. 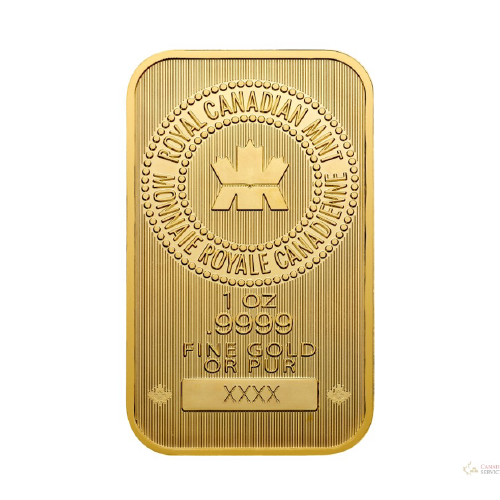 The 1 oz Gold Royal Canadian Mint bar is struck by the Royal Canadian Mint, a Canadian crown corporation that mints all of Canada’s circulation coins. Since it released Canada’s first domestically produced coin in 1908, the Royal Canadian Mint has acquired a global reputation for minting excellence. Today, the Mint’s superior technical capabilities allow it to set new benchmarks in coin design and quality and make it the producer of choice for many countries’ official coinage.